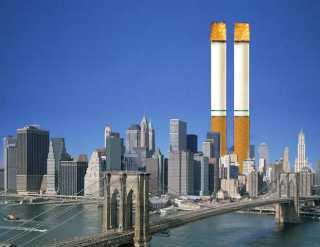 Following a second round of designs failing to provide a clear public favourite, the cigarette company Marlboro has volunteered its own design for a replacement World Trade Center design. Marlboro felt that the current proposals for replacing the World Trade Center in New York were inadequate so volunteered proposals of their own. The design features two towers like before, only soaring over 2000ft into the air making them more than 50% taller than the original twin towers that were completed in 1972. Despite being finished in 1972, the construction of the towers took several years and with more stringent health and safety legislation � not to mention the more complicated architecture involved in making such a tall structure safe � the construction process is likely to take far longer this time around. Cynics state that this is simply a convenient way of sidestepping the global ban on tobacco advertising � due to be introduced in 2005 � and were quick to point out the likeness of the towers to a pair of cigarettes. In response, Marlboro stated that it would not sink to such lows explaining that September 11th was a sensitive time for all Americans. It stated that it valued human life and would never exploit people, particularly those who had died as a result of being victimised.